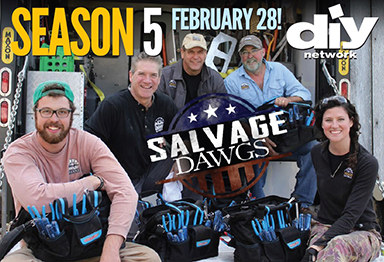 Season 5 of the popular reality TV show “Salvage Dawgs” premiers on the DIY network Sunday, February 28 with new episodes at 9:00 and 9:30pm EST. On the program, the “Dawgs” use a Mickey body on an Isuzu chassis to move architectural elements from homes and historical properties. Last year Mickey’s Recon Team in Thomasville, NC retrofitted the Dawgs’ Show Hauler (a Freightliner RV/garage combo) with a Maxon BMR Rail hydraulic liftgate to help safely load valuable assets onto the truck. The retrofitted Show Hauler will be featured in a couple of recently-filmed Season 6 episodes which will air later this year. Exact dates will be announced in the Fall. In addition to the Show Hauler with lift gate, the season 6 episodes will feature the team’s new Mickey van body on a new Hino chassis. “We sincerely appreciate our partnership with Mickey and look forward to promoting the Mickey brand,” says Christa Stephens, Branding & Promotions Director for Roanoke, VA-based Black Dog Salvage.